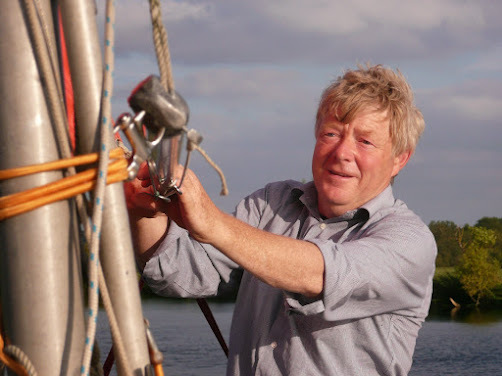 Dylan Winter describes himself as “a witty old hack”, he describes his boats as “unremarkable yachts”, but he describes his country as “a most amazing island”. For those of you who don’t know Dylan, you simply should! He started out with £3000 in the bank, bought himself a 50 year old Mirror Offshore and set sail from Bembridge on the Isle of Wight. His mission was simple – Keep Turning Left! Over the last 8 years Dylan has accrued a fan base of M.O.B’s (more on that acronym later) from all over the world. He has regularly produced and uploaded short videos that document his journey. He is blessed with an artistic eye, a keen sense of humour and an investigative sense of adventure. This truly unique and inspiring journey has recently reached its half way point. I am delighted and privileged to be able to interview Dylan and find out more about this “Middle aged, middle class man from middle England”. Pete: I think that sailing is inherently adventurous. You have started something that many people dream of, but will never do. 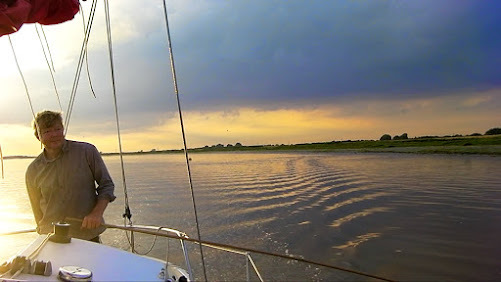 With so many exotic destinations out there, what on earth made you decide to sail all the way around the cold and treacherous waters of the UK in a tiny yacht? Dylan: Almost no paperwork is the main reason. Plus, when it starts raining I can get in the car and drive home! No pirates, no malaria, every tap provides drinkable clean water, the NHS, the RNLI, chip shops, the co-op. 20,000 miles of extremely crinkly coast to explore yet never more than 20 miles from a completely safe harbour. Sailing is safe and easy; anyone who pretends otherwise is a drama queen! Pete: So, has it really all been “safe and easy”? What have been the most challenging aspects of your trip so far? Dylan: There have only been two nervous moments during the trip. 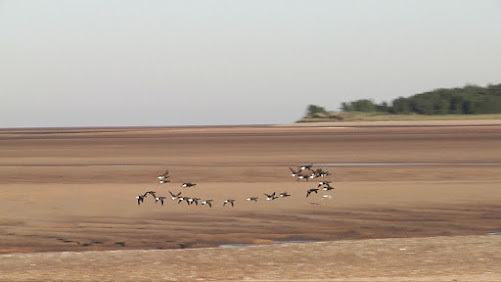 The bar at Wells next the Sea is a miracle of nature, It is a wonderful place to walk across the low tide sand flats and watch the birds, the sparkle of water and the winding channel. However, at high tide in any sort of Northerly the channel does a horrible 90 degree dog leg that takes you beam on to the waves – bloomin frightening in an 18 footer with a failing inboard! 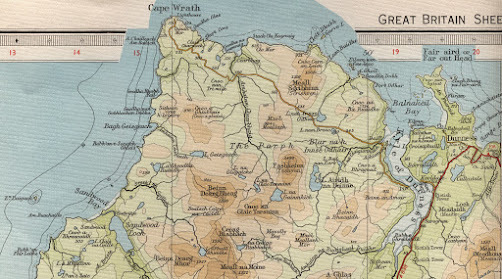 The second, with plodding predictability, was the journey back from Shetland to Cape Wrath. We made fantastic progress in benign conditions as far as Orkney and I should have turned into Stromness and Scapa Flow but I decided to press on. During the night the wind freshened and when it was wind against tide in the Pentland Firth it did get a bit lumpy. We were in the Centaur – a third of a genoa out, tiller pilot steering – 2 AM after 24 hours at sea. It was the first time that I have ever hallucinated on a boat. But the Old Centaur is a magnificent boat and really took it all in her stride. The weakest part of the system was me. We are the luckiest sailors ever to have existed – immortal and super strong plastic boats, perfect GPS navigation, never more than an hour away from rescue by the RNLI and almost perfect weather forecasts. Pete: You have documented your journey with some incredible video footage. What has been the most memorable experience that you haven’t managed to capture with the camera? Dylan: Several! Mainly some great bird shots that I almost got. If I see a lovely bit of landscape unfolding and I do a bad job of framing the shot then I fire up the engine, turn around and do it again. The biggest thing that never gets to the films is sitting in the cockpit with other sailors making heroic assaults on bottles of cheap whisky! Pete: And you must have met some characters along the way? Does anyone in particular stand out? Dylan: Yes, Andy Baldwin. He sailed a small steel boat to Iceland without a cooker! He then turned it into a human powered bike and sailed it back. I met him in Scarborough. This is just one of his remarkable projects. At the other end of the spectrum is this bloke I met on the pontoons at Gainsborough. He was on his way to the South of France to pick grapes. However, the nicest bloke I met was Superdave. When I was prepping Harmony for the trip to Shetland he turned up and started tearing out the electrics. He used to maintain a charter fleet of 100 yachts in the BVIs and could read an electrical installation the way a vicar read a bible! Fantastic man; all he wanted was cups of tea. I was blogging about the work and a series of MOBs (mostly old blokes) turned up. Some to look, some to yak, some to offer advice, some to tell me about their own sailing adventures and others turned up with a tool box. God bless them all. Even the useless ones could be sent to the galley to make tea. The origo was doing overtime during the fettling period! Pete: You now have a very loyal fan base and you describe your fans as MOB’s (mostly old blokes). Can you tell me a bit more about what this means and more importantly what they mean to you? Dylan: When I started I was doing it just for fun. But as a cameraman I took along a £100 cannon dv camera – bunged the films on youtube and people started watching them. 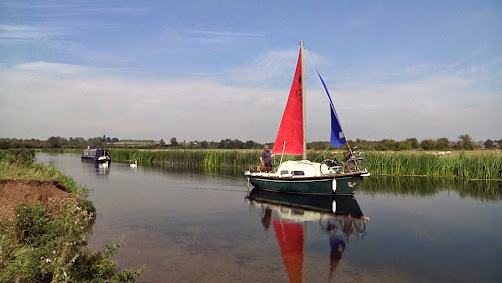 It is just me sailing the slug up the Alde at low tide with some piano music on it. One bloke emailed me to say he watched it every night with his bedtime scotch while he was going through a difficult period in his life and thanked me for saving his marriage. Steady on old chap! Youtube also tells me the age/gender of the people watching (50 to 70 year old men) and where they are. Fifty per cent are in the UK, 40 per cent in North America and Canada. The rest are Kiwis, Aussies, Safirs and the odd Dutchman. Then a Tollesbury sailor started burning them onto DVDs and distributing them to his fellow band width challenged sailors in return for donations to the RNLI – goodonim and goodonem I say. He asked me why I was not making DVDs and he offered to master them for me so I started selling them at £15 for a pop and suddenly I had a self sustaining project on my hands. Over the past couple of years DVD sales everywhere have declined now that most people can stream video to their computers or desktops. I have not personally bought a DVD for at least four years. Everything is free to stream now so it was time for a new model. So the films are on my website to stream or download in HD to their giant 50 inch TVs for free. Right by the download link is a paypal button – people can pay nothing or anything from £1 to £5. I reckon there are around 1500 MOB’s who not only follow what I do but also chip in with advice, encouragement and clicks on paypal. Of course there are also around ten times that number of lurkers who just watch the occasional film for free without commenting or contributing. There is nothing wrong with that as it has not cost me anything to make the films available to them – Google and vimeo take care of that. This is the new digital economy. It is a sort of crowd funding. Greater compliments do not come bigger than a bloke who clicks on the paypal button after spending an hour or two sailing with me. 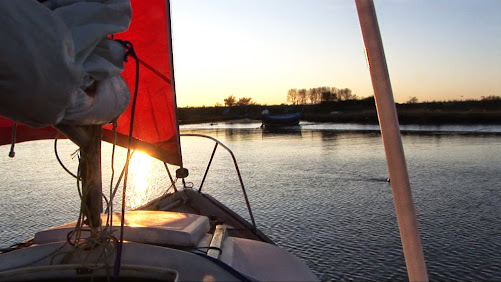 I still drive a crap car and sail a small boat so I am not rich but I consider myself fortunate that I spend most of my working and leisure time doing what I love – sailing. I now write a column for an American sailing magazine, write the odd bit for PBO and also do sailing club talks. Pete: So what’s next? 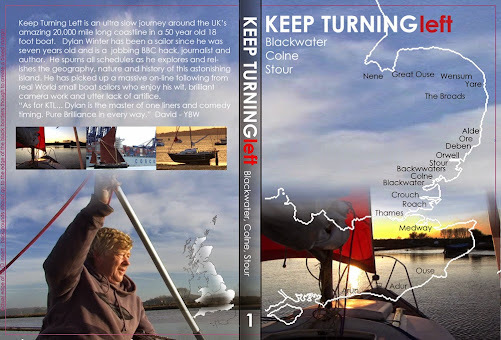 When you eventually get back to the Solent are you likely to do a Bernard Moitessier and carry on round again or has the experience inspired any other ideas for the future? Dylan: People often ask me two questions. When will you finish? Answer – not got a clue – my guess is that this little project has another decade to run but I am in no hurry and am loving my sailing more than I ever have. Where will I sail next? – Answer – I would love to spend a summer on the Chesapeake however I doubt that will happen. I would like to do the Atlantic solo just to see what happens to your head under such circumstances but I doubt that will ever happen either. While on the Humber I met a bloke who was 92 and still sailing. I am 59 so with any luck I might have a third of a century to go yet. I expect to end my sailing days in a twin keeler sailing the Colne and the Blackwater and still drinking cheap scotch in the cockpit of an evening. I might even buy another Centaur so that I can at least stand up to put my trousers on! Good Morning from Cyprus. I have been following Dylan on and off. What a character. From the “Old School”. Loved his candle in the inverted flower pot as a source of heating. I know Dylan as a Cowboy who road the Oregon trail with me in 1991. A fun guy. Ray Redman U.S.A. Brilliant :) What a lovely insight to a wonderful, talented man. At 45, would that make me a TYB (Token Young Bloke) amonst the KTL fans, or am I already past it?